Atec, Inc.’s Purchasing Department issues purchase orders only to Atec approved suppliers or vendors specified by our customer. Printed purchase orders are reviewed by a Vice President and sent to the Quality Assurance Department to ensure proper quality requirements have been included. We utilize Purchase Orders as a means to ensure accountability, repeatability, and traceability for items in the field. 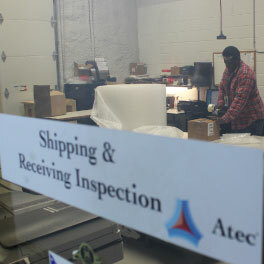 Atec Buyers review terms and conditions regularly and are able to purchase and quickly identify the best price and terms by checking archived supplier quotes, purchase history, from Atec’s, Celtech’s, Hager’s and Vital Link’s combined 160 years of operating records, and using competitive bidding practices. Atec, Celtech and Hager utilize a reliable ERP system, Global Shop, to generate purchase orders, which allows for self-regulation and open communication across various integral departments (Accounting, Contracts, etc.). Our highly efficient ERP software not only enhances our inventory control, but it also streamlines our purchasing capabilities and inventory management. Vital Link will soon be on our world class information system, giving integrated visibility to customer orders throughout our companies. We utilize Purchase Orders as a means to ensure accountability, repeatability, and traceability for parts in the field.